A vibrant fruit salad to wake up tired taste buds at breakfast time. Peel and remove the pith from the orange, grapefruit and one of the clementines. Slice and arrange on plates. Zest and juice the remaining clementine, then scatter and drizzle over the sliced fruit. Heat a non-stick frying pan over a medium heat. Tip in the seeds and toast for 1 minute or until fragrant, then add 1 tablespoon of the honey and bubble for 30 seconds until caramelised. Tip onto a sheet of baking parchment and set aside until cool, then break into small pieces. Stir the remaining honey into the fromage frais. 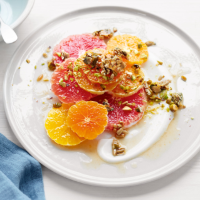 Spoon on top of the citrus salad and scatter with the crunchy seeds and chopped pistachios before serving.